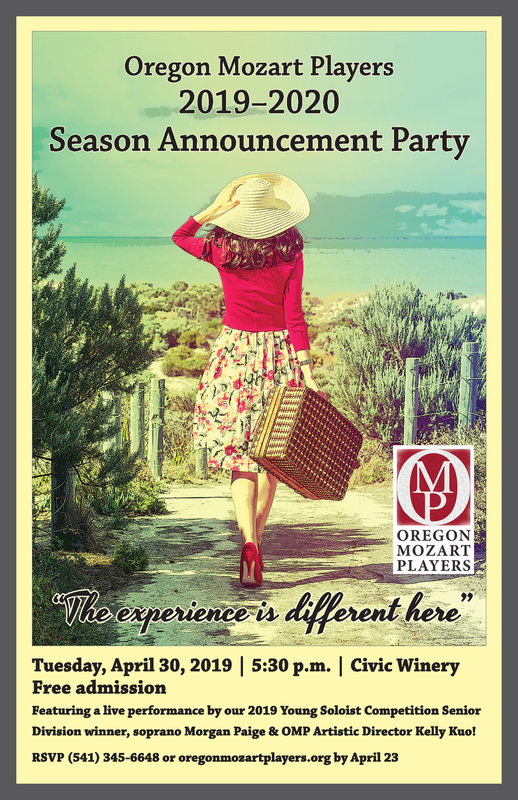 Tuesday, April 30 | 5:30 p.m.
Join us for our 2019-2020 Season Announcement Party! We'll be announcing the great things we have planned for next season, as well as featuring a performance by 2019 Young Soloist Competition Senior Division winner, soprano Morgan Paige and OMP Artistic Director Kelly Kuo! Civic Winery is located at 50 East 11th Avenue in Eugene. Admission is free; however, your RSVP guarantees a glass of Civic Winery’s delicious local wine and helps us ensure we have plenty of hors d’oeuvres to go around! Please RSVP by calling our office at (541) 345-6648 or at the button below before April 23. We are accepting RSVPs online through Blackbird. While the event is free, your RSVP provides one drink ticket for a glass of Civic's wine and ensures we will have plenty of hors d'oeuvres!